OME 1.2 SNMP alerts - how can I make them less generic? I have configured SNMP alerting but the alerts are so generic that I have to log onto the server to see what happened. Example, last night the array controller batter started a recharge cycle. But the actual alert in OME is so generic I can't tell what happened: and the email alert it sends me also has the same lack of information. Is there some kind of setting that will give more information? 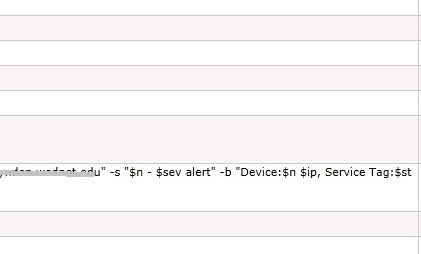 RE: OME 1.2 SNMP alerts - how can I make them less generic? It looks like you set up the SNMP trap, but didn't set it to email the alert. The email will be specific and detailed ot the issue. So it says "Message" as part of the alert but the message doesn't seem to have anything useful. Make sure OME and the agent on the other end is up to date. That is most likely OpenManage Server Administrator (OMSA). Also, depending on the server, some of them won't give that much information, such as the PowerEdge SCxxxx servers. The SC servers also won't show much in OMSA though. I am having the same exact problem and have all the trap qualifiers being sent in email, but the email is rather useless and I have to log into the server every time to actually make heads or tails of the problem other than if the server went offline and the message says down. I have all PE2950 II & III servers that I am monitoring with OME 1.2.1.0 and all servers have OMSA 7.3 on it. This alert wound up being a temperature alarm, one would have no idea what it was by this message below, this is completely useless. Any advice..?? I have the same issue, any answer from Dell ? I did not receive anything useful from Dell on this. After checking more, I don't think the problem is actual events happening on the server being sent as traps. In my case, I believe the issue is that the servers are receiving SNMP queries from some other box. Since I had them configured to send traps to my Openmanage server, they are reporting that the query did not have the right security and nothing else. Looking at the images above, my example event happened at 12:03, the trap I received is 12:08, I had assumed it was just a delay in reporting, but I think the original event was never sent and the alert is unrelated. I was able to resolve these spurious alerts by turning off trap forwarding from my servers to the openmanage server. I still get 'system down" alerts but I don't know about any others. That's unfortunate that you had to do that. I am having the same issues. Kind of severely limits the usefulness of OME. I am convinced that alerting is completely unreliable. I happened to discover that one of my servers has a dead power supply and although the website shows a red X, I never received an alert. I've given up on it and just remember to check the website every couple of days.